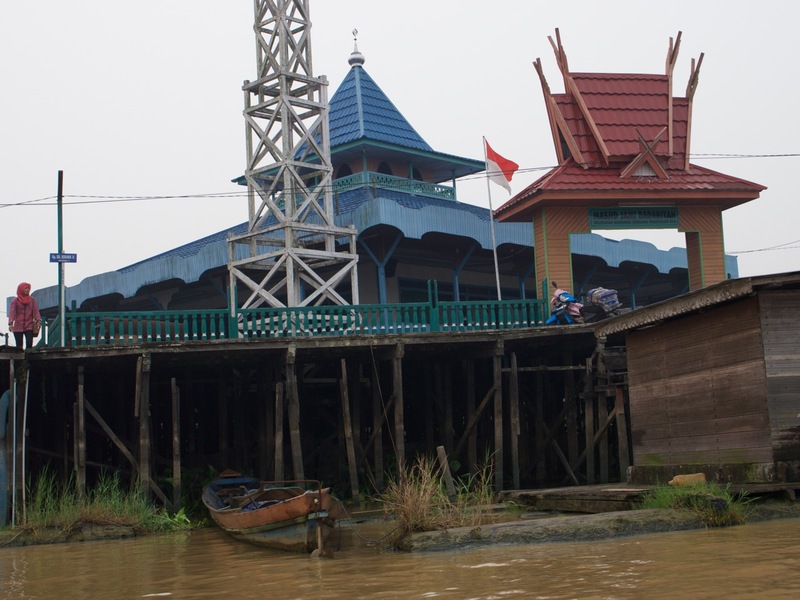 Here’s the third of three posts about our trip to Kalimantan. The first covered the strange journey from our B&B in Jakarta to our ecolodge in the jungle of Borneo. The second post covered our klotok trip, where we spent three days and two nights on the river watching birds, orangutans, and other wildlife. There’s also a short post of a video I shot of an orangutan mother and child that I think everyone should watch. 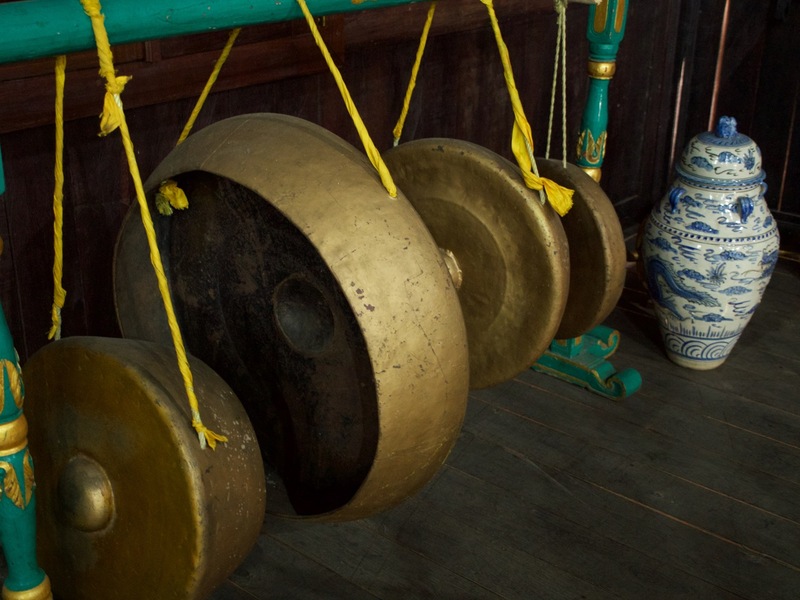 This third post is about the one day we spent touring around Kumai and Pangkalan Bun, with our tour guide. Siti and our driver picked us up at our dusty hotel shortly after breakfast, and we got underway. She’s very energetic and talkative and knowledgeable, all great characteristics of a local tour guide. Our first stop was a Dayak longhouse. The Dayak are a native people who lived on Borneo before Malay people “settled” it (through force of arms) a few hundred years ago. 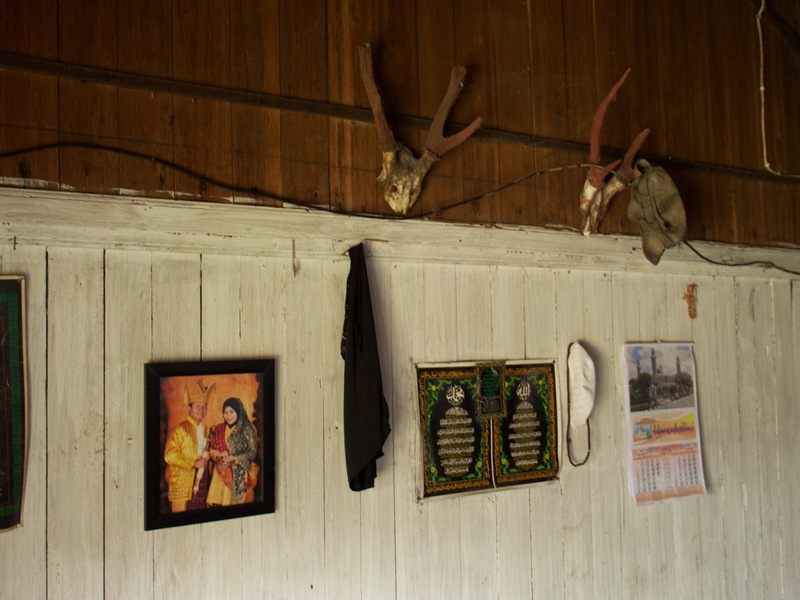 Like these stories usually go, the Dayak have been marginalized and their culture nearly exterminated, but they hung on. This longhouse is the traditional type of dwelling they lived in, raise off the ground on posts, with high ceilings to keep it cool and maximize any breezes. 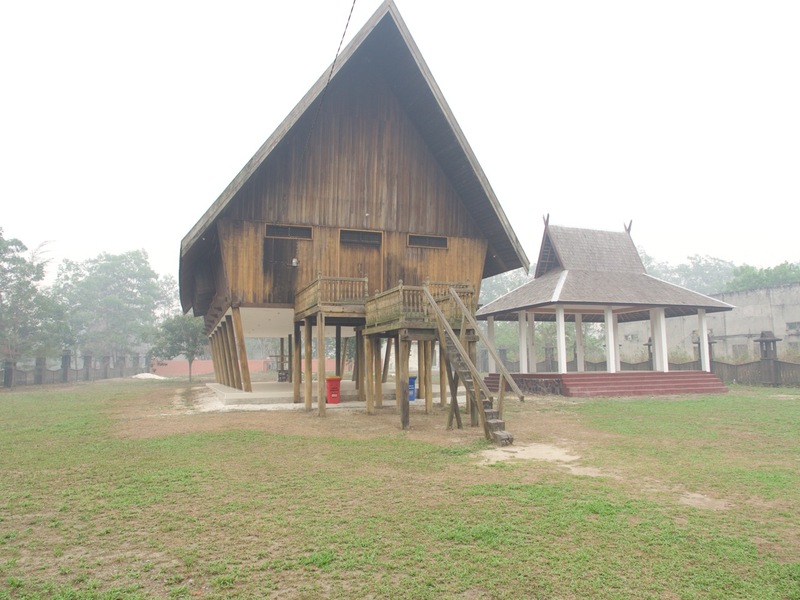 Suddenly, when Western tourists started to appear here recently, someone got the idea that rather than letting this old longhouse collapse any more, they should fix it up for the tourists to see. So now it’s been refurbished, but still keeps a somewhat classic character. Siti says that “Dayak” is a Dutch word for “wild person” but it sure doesn’t sound Dutch to me. 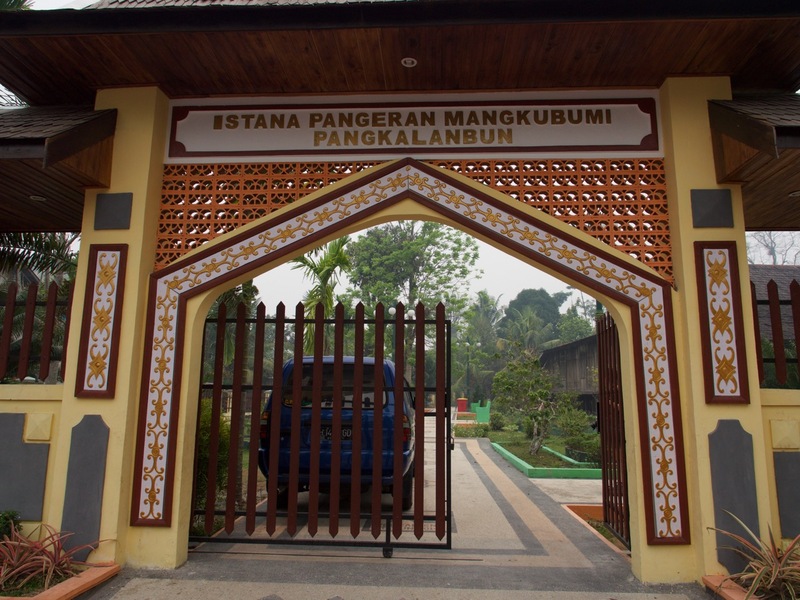 Pangkalan Bun has a lot of Christian churches compared to other parts of Indonesia (especially Java) because the missionaries were so successful. There’s a Catholic church right next to a mosque, across the street from a Protestant church. But I didn’t take a photo, so let’s move on. The next stop was at the princess’ palace. This palace was built to be used only by the daughter of the sultan. You see, much of Indonesia was ruled by sultans, who came to power after Islam swept through the archipelago. The creation of the nation of Indonesia after WWII was accomplished when all (or at least most of) these sultans agreed to turn over their power to the national government. But the royal families still remain. After the princess’ palace, we stopped for lunch. Our driver had fried fish, Siti our guide just had a yogurt drink, and Beth and I had Indonesian meals. Mine was served with a type of sambal I hadn’t had before, and it was delicious. 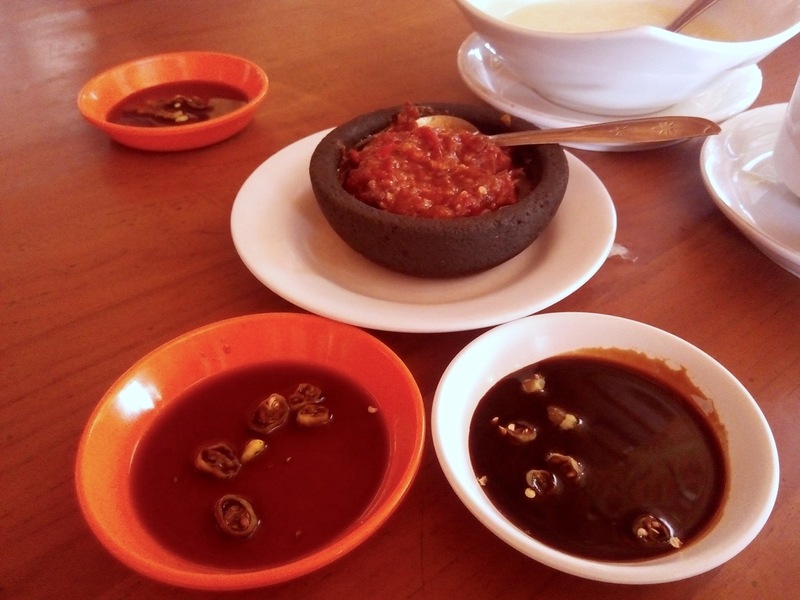 It is called sambal bajak, and it contains chile, garlic, shrimp paste, salt, sugar, onion, and tomato, all ground up and served in a thing that’s the spitting image of a Mexican molcajete. That’s the sambal bajak on the top of the photo. On the lower left is soy sauce with chile, and on the lower right is a sweet sambal made with soybean paste. I’ve had both those others in other places in Indonesia, though I don’t know their names offhand. After lunch, we drove down to the area by the river. Here, another ethnic minority live, a people who, as best as I could understand from Siti, are a specific mix of Malay and Chinese. Siti made a funny face to show us how their eyelids look Chinese, unlike hers (or ours). She negotiated a boat ride for us, and the driver, a fisherman with a long motorized canoe, took us out on the river. We went up one side of the river, and back down the other. Something about this photo appealed to me. It’s a school girl getting a ride home from school from her dad in his boat. I couldn’t tell whether she was using a tablet computer or actually reading something, but she seemed oblivious to the world. The boat trip was quite an adventure. 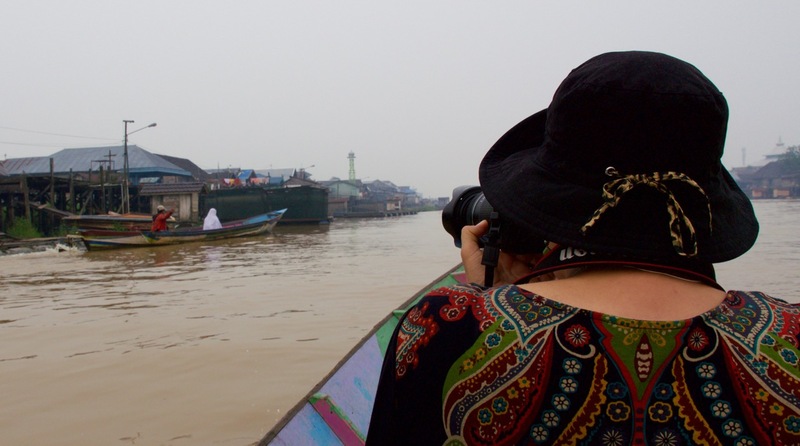 Beth, with her purse, binoculars, and camera hanging off her, almost tripped on the way down the gangplank. And the boat was so low in the water I was afraid at first we would capsize it. Siti is large for an Indonesian woman, and I’m huge compared to Indonesian men, and Beth is much larger than most Indonesian women. So with the three of us plus the skinny little fisherman in the boat, we were a heavy load. But it was huge fun once we got up to speed, and we got to see people going about their daily lives on both sides of the rivers. So many people waved and smiled at us from the banks. At the conclusion of our boat ride, we careful got out of the boat and back into our driver’s car. I guess I should point out that at each stop along the way, the driver stayed with the car. Sometimes he would wander off to get a drink, or sit in the shade. But that’s how things are done. Most people who need a car for several hours rent one along with a driver. Since labor is so cheap compared to the price of the vehicle itself, you can get a car and driver for only slightly more than just the car. And then you don’t have to worry about parking…someone else’s problem! And you don’t have to worry about someone vandalizing or stealing the car…someone else’s problem! And most of all you don’t have to worry about driving in the chaotic mess of Indonesian traffic…someone else’s problem! The driver then took us to the Yellow Palace. This is the sultan’s second palace, and part of the entrance fee is to pay for a tour guide. In our case, our guide was actually a member of the royal family, the grandson of some sultan (I can’t remember if it was the current sultan or the previous one). So that was cool. We saw portraits of all 14 sultans throughout history, various treasures from Kalimantan and abroad, some weapons, etc. The original second palace sadly burned back in the 80s, and the only thing that survived was the flag pole. So they kept the flag pole, and built a new second palace to look exactly like the original. It’s in three buildings of different styles. One section is Chinese, because one of the past sultans had a thing for Chinese girls and took one as a wife. One section is Malay, since the royal family is ethnically Malay. And the third section is in Portuguese style, because the sultan also had a thing for hairy women and so he married a girl from Portugal. 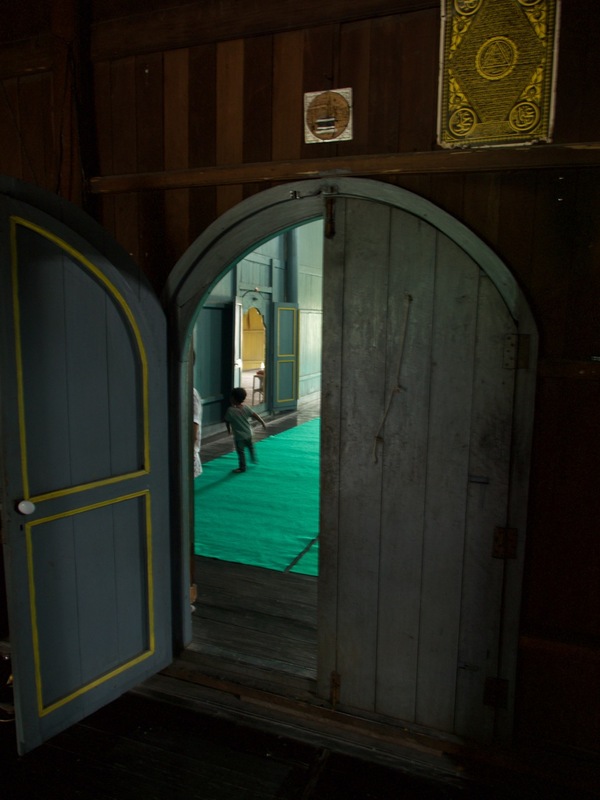 One interesting thing was the sultan’s door. It’s got his number on it, and nobody except the sultan is allowed to go in there. I asked for permission to photograph it, which is allowed. But the photo turned out crappy, so let’s continue on! 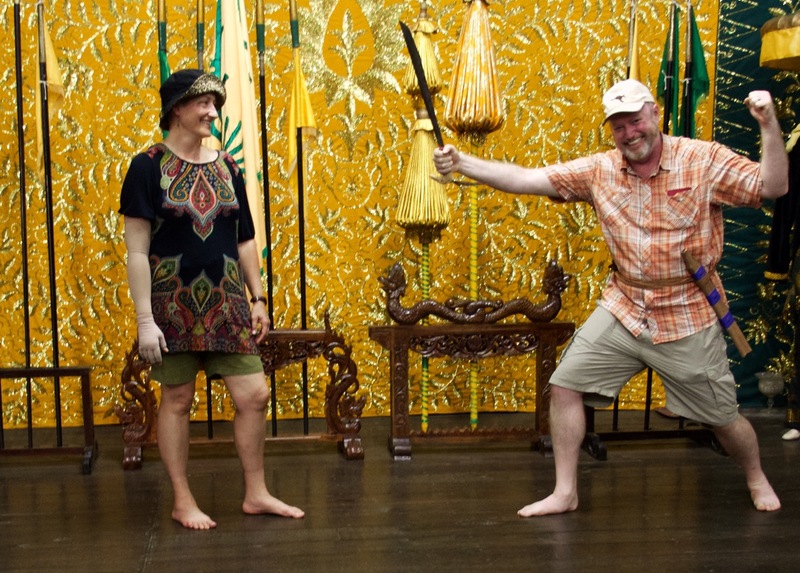 As we were leaving the Yellow Palace, an Indonesian tourist (yes, there actually is such a thing) asked to take a photograph with me. I had no idea who he and his friend were, but they were taking photos of the buildings just like we were. I thought it was funny that he wanted a photo of me, but I said “yes” of course. That’s how rare white people are in Pangkalan Bun. When you see one, you wave or you get a photo, I guess. I’m sure it helped that I was wearing my cheap Australian hat that day, with a kangaroo on the front. The next and final stop on our tour was Yayorin. This is an organization that’s working for orangutan conversation in a few different ways. They have an office and education center and homestay on a large plot of land. There’s also two ponds, lots of trees, and at least one cow. We originally tried to stay at their homestay, but they were having water problems and couldn’t accept our reservation. But we looked at the room we would’ve stayed in. The whole time we were in the jungle on our three day orangutan boat trip, I heard one mosquito, saw one mosquito, and got bit zero times. In the 60 minutes we were at Yayorin, I heard hundreds, saw several, and got bit about 10 times. So frankly I’m glad that we stayed in the dusty hotel down by the river in Kumai instead of the Yayorin homestay. Also, in Kumai we could walk to a half dozen warungs for food, as well as a couple convenience stores. At Yayorin, we wouldn’t be able to do either. Also, the Yayorin homestay rooms didn’t have air conditioning, which was a really nice feature of the hotel in Kumai after coming in off the river trip. Yayorin is doing good things, though, and we gave them a donation to plant two more trees in our honor, a nyatu tree and a rambutan tree. If you read my previous post, you may remember that we funded a tree at one of our stops in Tanjung Puting. Well, Yayorin is doing reforestation even farther back in the wilderness. So now there are three trees with our names on them! We also had a nice little dessert treat in their office. On the way out we learned a little about efforts to protect the Borneo wild ox, which is even more endangered than the orangutan, apparently. After that, the driver took us back to our hotel, and Siti said goodbye. She said she would see us the next morning to take us to the airport. 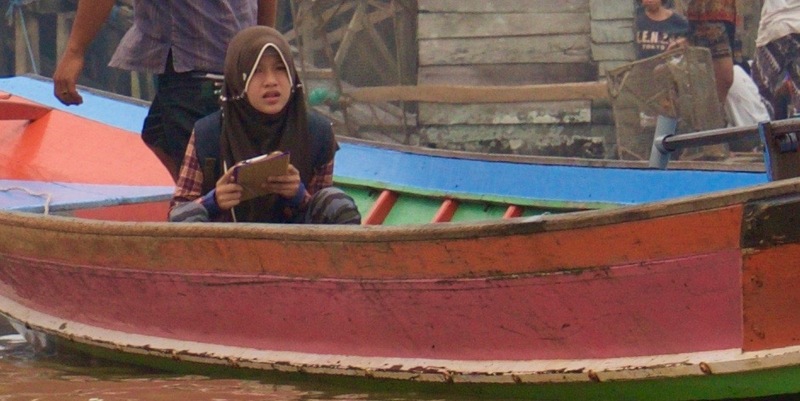 But although a driver showed up the next day at our hotel, we never saw Siti or heard from her again. Getting off the island of Borneo was the low point of the trip. Our flight was delayed about 12 hours due to forest fire smoke at the airport, nobody would ever give us information about when to expect the aircraft to arrive, the airport ran out of all food except instant noodles, we missed our connecting flight to Bali, and therefore forfeited our room at the Bali hotel. Fortunately, Beth bought a travel insurance package before we left Denver, so now we get to see how that works. We did eventually get to Surabaya and stayed in a nice airport hotel there — the nicest accomodations we’ve seen in Indonesia. And we purchased new tickets for Bali the next morning. That’s where I am now, as I write this. Nice that you got to Tanjung Puting before it has completely burnt down. I loved my klotok trip up to Camp Leakey. Did you notice the 250,000 swiftlets in Kumai and their bird hotels producing bird nest soup? We didn’t see that many swiftlets. Our tour guide pointed out that many of the bird hotels are empty and just play recordings of bird songs to try to attract the birds, but aren’t succeeding getting them to move in.